Tottenham have apologised after a video mocking Liverpool's collapse in the title race appeared on their Twitter account and say they will investigate. 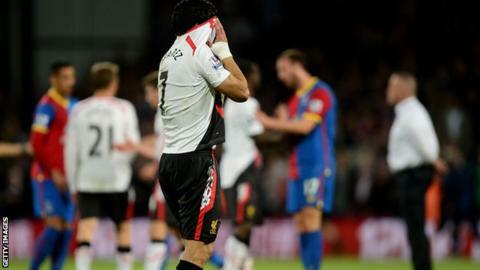 Liverpool drew 3-3 at Crystal Palace on Monday night to all but surrender the title to Manchester City. A message reading "brutal but very funny", accompanied by a video of Reds striker Luis Suarez crying, appeared on Tottenham Twitter feed. Spurs quickly removed the post and are looking into a "security issue". The offending tweet, which appeared after Liverpool threw away a three-goal lead at Selhurst Park, also said: "The biggest capitulation since Newcastle in the 90s." The post was a reference to the 1995-96 Premier League season, when Newcastle let a 12-point lead slip to finish second to Manchester United. Monday night's message was accompanied by a video that segued from Liverpool captain Steven Gerrard leading an inspirational team huddle after victory over Manchester City to his slip against title contenders Chelsea, an error that gifted the Blues the opening goal in their recent 2-0 win at Anfield. That was followed by footage of Dwight Gayle's equaliser for Palace, a close-up of the 3-3 scoreline from Sky's coverage and an unrelated clip of Palace boss Tony Pulis laughing in a BBC interview. After removing the posts, Spurs tweeted: "We are currently looking into a security issue where our official Vine account has been compromised. We apologise to anyone offended by a recent tweet, which was immediately deleted. This post was not tweeted by anyone affiliated to THFC." Liverpool are top of the Premier League with one game to play but are just one point clear of Manchester City, who have two matches remaining. Chelsea, who have one game left, are third, two points adrift of Liverpool.